I really wanted to love this book. The world building is fantastic, the plot was engaging and almost perfectly paced and most of the characters were beautifully crafted, but I was expecting a little bit more of...well, something. 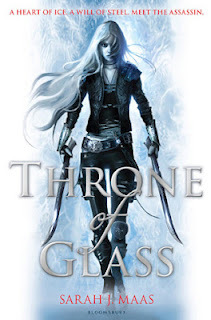 My biggest issue with this book was that, Celaena was not the ice-hearted assassin that I was expecting. She may have been at one stage but she didn't seem to behave in the way that one would assume an assassin would. Perhaps she used these habits to her advantage in the past and this is what made her so good at her profession, or because of the target audience the author 'girled' it up a bit for more appeal. Despite of this, Celeana was still a likable character, strong willed and stubborn. There was a bit of a love triangle happening and the male characters were likable and I was torn between which one I liked best. They were both charming in their own ways, although sometimes cheesy, but that just made them more believable. My favourite character would have to be Nehemia. She was loyal, courageous and mysterious not to mention smart. I would have liked to have seen more of her in the book and hope that she will be appearing in future books. I loved the action scenes, they were well written and flowed nicely throughout the course of the book, leaving me eagerly turning the pages to find out what happened next. Overall, I enjoyed the book enough to keep the pages turning even though I was hoping for a little more assassin and a little less girly frivolity. A nicely paced, easy read for a young female fantasy lover or someone just getting into fantasy novels.